Today is one of the saddest days I can remember in 47 years of having been an Iowan. 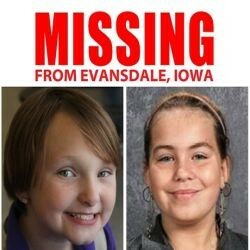 Last summer two little girls, cousins, were riding their bikes by a lake and disappeared near Waterloo, Iowa. The lake is visible from Highways 20 and 218. It’s a beautiful and presumably safe place. I don’t know any Iowan who does not have a heavy heart right now. The story has been in the media for months and there have been thousands of leads. People came out in droves to help search, print fliers, aid in any way possible. This was the first major development but it was one that nobody wanted in this form. I remember when the story broke about a potential abuduction. I was thinking “Oh, my God! No, not here!” This is something that you just don’t see in Iowa…just on the picture boards at Walmart. But it is everywhere. It was one of those moments when a person stopped everything to say a prayer. 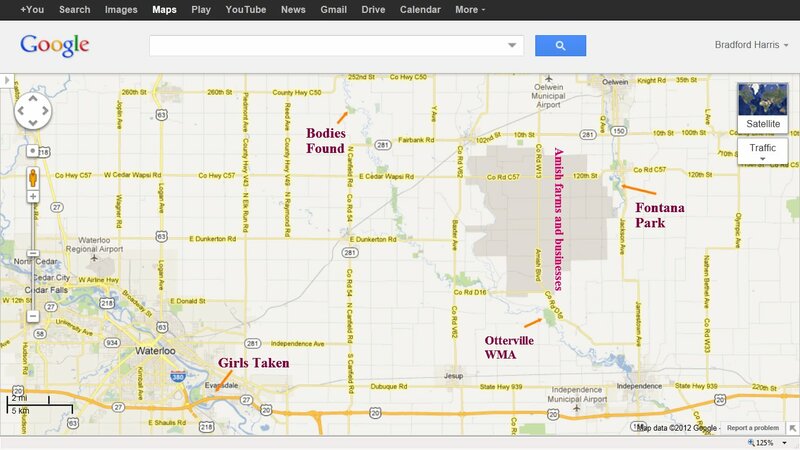 The two bodies were found at Seven Bridges, a park along the Wapsipinicon (“Wapsi”) River in Bremer County. The public land along the river is woodsy and secluded – a perfect place to hunt, fish, and camp. Unfortunately, it’s also sometimes used for bad reasons. A week ago I was awakened by a sheriff’s deputy while camping at Otterville, a dozen or so miles downstream in neighboring Buchanan County. The deputy was as nice as can be but I suspect he might have been checking me out at least partly because of the case with the girls. I didn’t mind. It’s understandable and worth the minor inconvenience. Under those conditions, exercising patience is the least a person can do to assist. 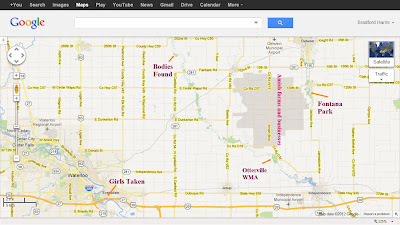 In the 1970s, the creeks and rivers in this part of Iowa used to be a fun place to hang out as a kid. Grandma and Grandpa Harris lived in the area and it still feels like a second home. With many wildlife management areas, it is prime for “living down by the river” whether it is for a day or for months. But with all the meth problems we are having in rural Iowa, this part of the Wapsipinicon River is becoming a corridor for crime. It wasn’t always this way. When looking at the map today I wondered why none of my outdoors type friends ever mentioned the 7 Bridges area and I’d never stumbled across it before. Normally it would be a great place to investigate – a fantastic place to boondock. I’m not so sure I want to go there now. This tragic chain of events has been sort of a wake-up call that wildlife management areas might not always be a safe place to park alone any more. I am sure that Elizabeth and Lyric are in a better place than this old world. My heart goes out to their families. Let’s hope the sicko or sickos that did this to the two little girls will be found and punished severely. People who hurt kids don’t deserve to breathe. For those who pray, please keep the families of Elizabeth Collins and Lyric Cook in your prayers. Take care and God Bless everyone. May the Good Lord keep your kids safe from harm! So very, very sad, Brad. Sorry such meanness has come to Iowa, too. I think it’s everywhere. Hurting children is the lowest, most horrific crime there is. I always ask God for protection when I am out camping. I trust that instinct that lets me know if something is wrong. If I don’t feel that warning, I know I will be okay. The secret is getting away from the area as fast as you can when you feel that warning.